Dako’s mission is to fight cancer, by providing high quality antibodies, instruments and software we are raising the global standards for fast and accurate diagnostic answers for cancer patients. I produced this illustration for Dako’s marketing department, and it was ultimately placed into one or more of their catalogs. I started the illustration in Adobe Illustrator, just to get a row of polylipid balls to line up across the viewing plane, following the contour of the cell wall in a circular path. In retrospect, I think I could have made the cell even more circular, then applied some wave distortion to make the wall look more organic. Electron microscope images of cells I had seen showed that cells are typically less irregular shaped than I made them out to be, unless, of course, they’re misshaped by cancer. I had wanted to make the receptor shapes look more symmetric, like flower petals, but the client insisted on their ultimate depiction, like deformed spoon shapes. So my goal was to make the scene visually imperfect and organic, more realistic, less generalized. The DNA strand in the center was particularly challenging, and probably would have been more effective if I could have rendered it in 3D, but that is a skill I have, unfortunately, not developed in my illustration experience. 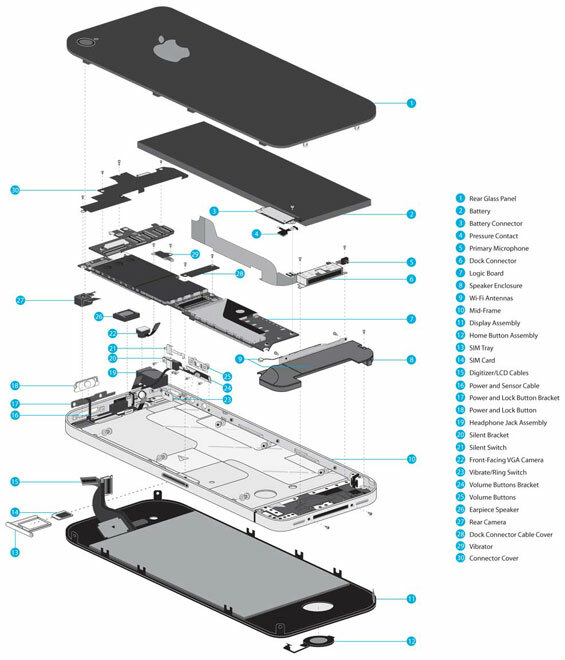 An exploded view of Apple’s iPhone4 rendered for iFixit.com. A few years back I applied for a website design/development position at iFixit.com in San Luis Obispo. iFixit.com posts photographic tutorials on how to fix a large variety of electronic devices that are out of warranty, and allows users to add their own repair experiences to the website, like a wiki-type forum. It was decided that I didn’t have the necessary web experience, but the CEO was interested in some of my line art work I had posted on my website. We met for lunch, then I took a tour of their facilities. I was then contracted to illustrate this exploded view of the iPhone 4. iFixit sent me an inoperative unit with a toolkit for dissecting it. Before opening the phone I had to decide how I would approach the project, knowing that if I fully disassembled the phone at the onset I would probably never be able to associate the relation of one part to the next. What I ended up doing was to carefully remove and illustrate one part at a time. Ultimately, I had illustrated and labeled practically every mart part within the phone, which numbered around 25 parts, each part on its own layer in Illustrator. Using well organized, labeled layers was critical to this project. Each layer was duplicated and the objects on the duplicate layers were filled with a red color, then each layer was brought into Photoshop. Each Photoshop layer was finally exported to a .png file for input on iFixit’s website, focusing on the relevant part being replaced on the iPhone. See below for an image highlighting the main circuit board in red. 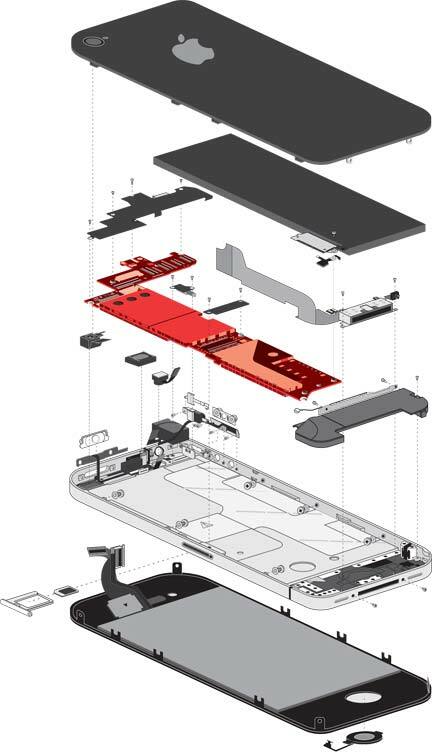 The main circuit board of the iPhone4 exploded view is hilited in red to show the iFixit.com subscriber the part being referenced. Each part of the exploded view is similarly hilited in red, corresponding to its own area in the website. Here is the link to the illustration as it is currently being used on iFixit.com’s website. Each of us is supplied with a variety of specialized “white” cells, namely macrophages, T-cells, B-cells, and antibodies. These cells are infused with shared chemical markers, and they all team up to fight hordes of invading bacteria at the site of an infection. After the battle is fought its memory lives on, so the next time your body faces the same infection, it can be defeated much more effectively. Add to that the huge amount and variety of other mostly benign creatures that reside inside, and they could all comprise a visual—albeit ghostly—walking proxy of yourself. Just don’t lend them your credit cards if they decide to take a vacation from your body. And if knowing that you are a walking biological repository of minute monsters doesn’t set well with your sense of unsullied sterility, then you could do worse than have to take a regime of strong antibiotics to help your white cells fight your infection. Except that you’d be destroying a bunch of benign critters in the mix, or at least upsetting their balance in your body for years to come. Adobe Illustrator-rendered object, using gradient mesh and perspective tools. My new little T-Mobile LG pay-as-you-go plan cell phone. Lost the Motorola V-330 on a bike trip, but it was too bulky anyway. This one is nice and slim. This is an Adobe Illustrator CS5 rendering of a vintage whatchamacallit lying around the house. After illustrating the faces of each gauge, I used the gradient mesh and perspective tools for the final rendering. Adobe Illustrator rendition of an early 20th century Chinese teak carving. For this project I used the gradient mesh tool over a photograph of the carving. Layering was very important so as to be able to select specific parts of the illustrations separate from others, however, it got pretty messy to work with toward the end of the process. And for some reason some of the objects seemed to jump from one layer to another, which was probably my own fault, but it was still a mystery to me why it was happening. The final top layer was a teak wood texture, blending mode set to multiply. Until I learned all the new features in Illustrator in the past couple of years, I would never have thought I could render an image like this outside of Photoshop. Cross sections of bone material. Shown are compact bone (left, top), spongy bone (left, bottom), haversian circles and their vessels (left, top), networking bridges called Volkmann’s canals, and in the center of the bone is a main vein and artery. 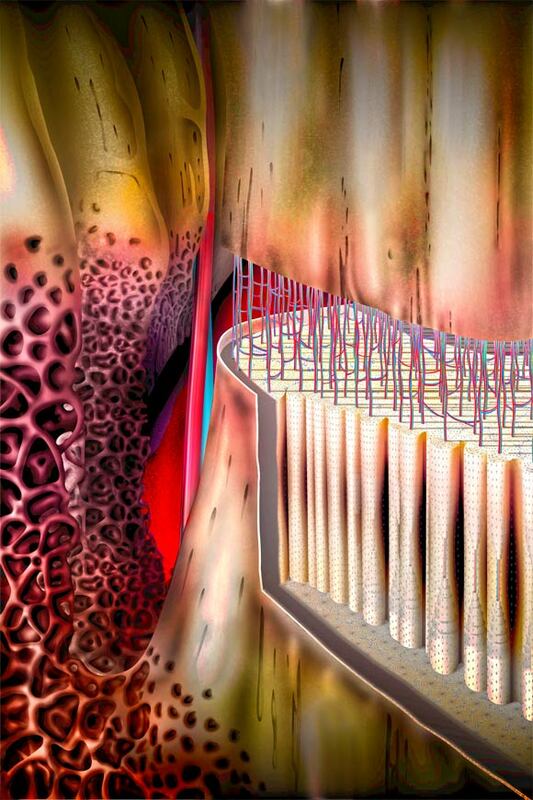 The periosteum is the wall around the compact bone (below, right), and the bone marrow lives inside the spongey bone.